Please register as soon as possible. If you miss this session, additional dates will be available in November. Do you need a respirator fit test? Your job description will dictate your need for a respirator. These masks are fitted, NIOSH approved, air-filtering respirators (not surgical masks). N-95 respirators can offer particulate protection against airborne and/ or aerosolized diseases. Reusable respirators can offer particulate and chemical/ gas protection. Please ask your manager/ supervisor if you are unsure. *Surgical masks and PAPR units do not require fit testing. Registration: Log in to Apollo, select “Search for Trainings” and type in “fit testing”. 3M 1870+ (N-95) respirators will be available for fit testing at these sessions. If you need a different model/ style, please bring one with you to your appointment. If you also need a reusable respirator (half or full-face, negative pressure), you need to reserve an appointment time for each mask AND contact Employee Health to arrange for the use of an adaptor. Take your reusable mask/s with you to your appointment. Your appointment will take approximately 20 minutes (for one fit test). Plan to arrive 5 to 10 minutes before your appointment; if you are late, you may be asked to reschedule. Males must be clean shaven where the respirator is intended to seal on the face. If you have facial hair, you cannot be fit tested and should not schedule an appointment. For more information regarding fit testing and what to expect at your appointment please visit the Employee Health fit testing share point page. Annual fit testing for respirator masks is an Occupational Safety and Health Administration (OSHA) requirement for any employee whose job description indicates a potential for exposure to airborne and/or aerosolized diseases. 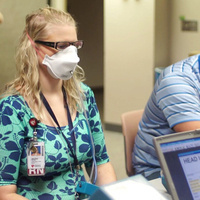 Fit testing and medical clearance is required before you use a respirator, annually, and/ or if there is a change in your physical appearance that may affect the fit of your mask, e.g., large weight gain or loss, major dental work, facial surgery (that alters the shape of your face) or scarring in the area of the seal.